Michael McFadyen's Scuba Diving - Sandy Canyons The reef that runs west from the main entrance to Port Moresby Harbour, Basilisk Passage, is called Sinavi Reef. It runs up past Fishermen's (Dango) Island and is on the southern side of the island. To the west of Fishermen's Island there are numerous dive sites. One of these is The Pinnacle and another is Sandy Canyons. To get to this site you can run inside the reef and island till you are north of the dive site. You can exit out to open water here through a very shallow channel (not suitable for anything other than small boats). On the western end of Sinavi Reef where the reef turns north and creates the channel, there is a spectacular dive site. After anchoring on the reef top in three metres, you drop over the wall to 8 to 10 metres. This has a number of indents and is not exactly straight. After dropping to the sandy bottom, you will see that the sand slopes quite steeply to over 60 metres. Off the wall to the north or north-west of the anchor location, the bottom of the wall is deeper at about 20 metres. This is only recent as the depth used to be more like 10 metres but the sand has either slipped or been washed away. You can see on the wall the level where the sand used to be as there is no growth below 10 or 12 metres and the bommies on the slope are totally bereft of growth. More about these later. From the anchor spot, head to the south and go deeper. You will see some bommies and around here there are a lot of fish, including a couple of clown triggerfish and a titan triggerfish. After five or six minutes you will see that the wall has turned to the west for a short distance before turning to the south again. The depth off the northern side of this small section of wall is 32 metres. Continue along the wall to the south and the depth increases to 45 metres or so. 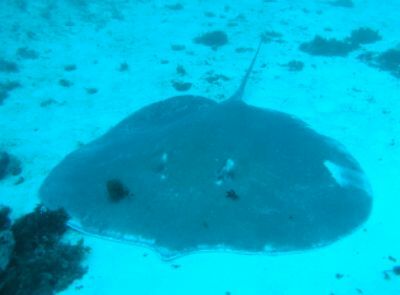 In this area we saw the biggest ray I have ever seen (or, in fact, any of us has seen). It is at least three metres across and perhaps five metres from the tip of its body to the end of the tail. Huge!! You are probably in deco by now so it is time to start a slow and gradual ascent as you move back to the wall. You will only have a minute or two but on the way back you will probably clear and then re-enter deco a number of times. Return back along the wall and near the anchor spot you will see the first of a number of canyons that gives the name to this dive site. Enter the canyon and you will soon see that there are intersecting canyons, much like the cracks between bricks. You can swim up and down them, although some come to dead ends. There are a couple of swim-throughs and small arches that add to the adventure. The depth in these canyons is about 8 metres or so. Once you have finished exploring the canyons, you can head north from the anchor spot to where the sand has been washed away. We saw a couple of grey reef sharks here. After exploring the small bommies, return to the wall and follow it back to the anchor spot. There are lots of anemones and clownfish on the top and excellent fishlife over the edge of the wall. This was an excellent dive, visibility on the bottom well over 35 metres (although poorer in shallows due to roughs seas that day) and water temperature 25.8°.